Our Centogram team imagines the Internet possibilities for your business; then we design and articulate whatever solutions it takes to swing open the gates and unleash your presence on the web. A few things you'll want to know about us: We get right to the point without a lot of fluff. We don’t waste time or money. We’re smart. We work hard. We love this stuff. And we’re really, really good at it. Centogram designs smart, effective solutions to meet our clients' needs, and we rally whatever resources we need to accomplish that. 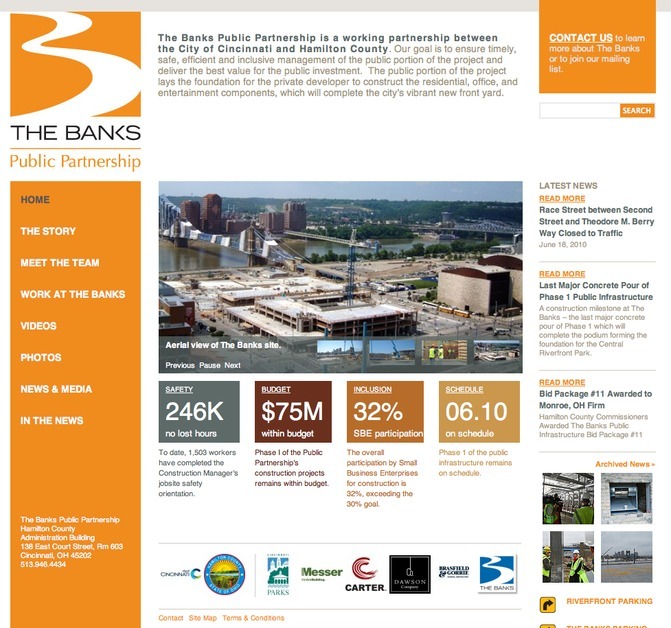 In the case of the Banks project, Centogram partnered with professionals in design and in marketing to build a site that shares up-to-the-minute information about a high-profile Cincinnati project. This Drupal-based site is built to automate content with current status metrics, press releases, photos, videos and more, all of which keeps the site dynamic and the citizens of Cincinnati involved in this city-changing venture.